Low profile drop in horn with grills. Design allows easy installation. Easily retrofitted. Comes with black and white cover. 12V. Designed for ABYC standards for boats up to 20 meters. Approved signalling whistle complete with white painted horn Ø 7.9. With electric compressor and mounting accessories. Meets COLREG 1972 IMO class IV regulations. Approvals: NMMA, LLOYDS REGISTER MCA. 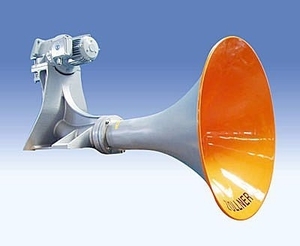 A ships horn is a device designed to emit acoustic signals. In reduced visibility, the horn may be sounded while underway, at anchor or during maneuvers. In normal visibility, it is used to signal the ship's intentions such as changing course to port or starboard or moving astern. Depending on the vessel's dimensions, its horn operates somewhere between 70 and 700 Hz, with a range of one to two miles. Ships horns usually operate on either compressed air or electricity. Vessel length will determine choice of horn and its frequency. Technical details can be found in Appendix III of the RIPA.